Join Our CyberGuide Live Chats! 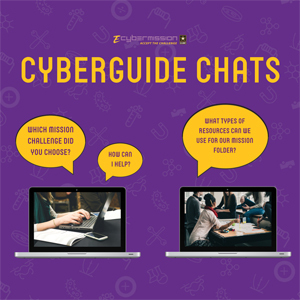 CyberGuide Live Chats are online chats with STEM professionals and eCYBERMISSION staff. Login and ask questions about eCYBERMISSION and completing your Mission Folder. These chats are your opportunity to discuss your project with professionals who will share their expertise and lend their support. Live Chats hosted twice a month! Get answers to your questions and tips about how to make your Mission Folder even better! CyberGuides and former Virtual Judges will share insider tips and offer support all the way until submission! Team Advisors, individual team members, and/or the entire team may participate in these sessions. Below, you will find the CyberGuide Live Chat schedule. Please use the link below to access the chat session at the designated time. You do not need a microphone to participate in the discussion, but if you have one, you may use it! Join us for the next CyberGuide Live Chat on Feb. 26th at 5 PM ET. CyberGuides, former Virtual Judges and Mission Control staff will be online to answer all your questions.